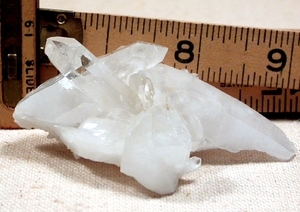 2x 3x 1 1/4" powerful milk to clear Arkansas cluster with many surprises: beautiful small quad point crystal; penetrated X crystal - 1/2 the X has 9 faces [very rare]; curved and penetrated twin; curved striped crystals. Parallel and point regrowth to base. Vibrant rainbows, 2 isis faced crystals. What will you make of ROUND veils?